Three Sisters Lighthouses in Nauset, Mass. Located at Nauset Beach a short hike from Nauset Lighthouse. To help mariners differentiate between the Highland (Cape Cod) Light in Truro to the north and the Chatham Twin Lights in Chatham to the south, in 1837 Congress authorized funds to build three small lights at Nauset, which came to be known as the “Three Sisters.” to mark the dangerous Nauset sand bars off of Eastham. These lighthouses came to be known as the Three Sisters because many locals felt they resembled three girls wearing white dresses and black hats. These Nauset lights were America’s first and only three light station. To distinguish the Nauset Station, a keeper's house and three small towers of brick were constructed 150 feet apart. Two towers were taken out of service by 1911 when the cliff had eroded to within eight feet of the northernmost tower, when the Bureau of Lighthouses finally decided to change Nauset to a single light. The ‘Sisters’ were moved back from the edge of the bluff, and discontinued. 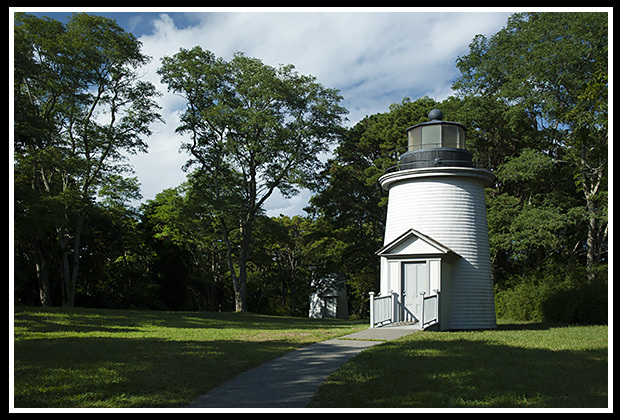 The third was replaced in 1923 with the "New Nauset Light" as the north light from one of the twin lights at Chatham, where Chatham also became a single light. In 1975, the National Park Service purchased all of the Three Sisters Lights and conducted a half million dollar restoration effort over time that was completed in September, 1989. The Three Sisters are open as a park to the public, although they are not used as aids in navigation. They can be viewed from a short walk from Nauset Light Beach. Plenty of space to enjoy the views of the cliffs and sun at Nauset Light Beach. The Three Sisters Nauset Lights are located about a third of a mile from Nauset Lighthouse. The National Park site is open to the public with rangers offering tours from spring to fall. During the summer months, you can tour the Nauset Lighthouse tower. Eastham is a small town that is known as the entrance to the Cape Cod National Seashore. In the park just off from Route 6, you'll find the Eastham Windmill, the oldest windmill on the Cape, originally built in Plymouth in the 1680's. Every September there is a 3-day Eastham Windmill Weekend with all kinds of events. Take Route 6 north on the Cape to Eastham and Bracket Road, the third traffic signal from the Eastham/Orleans rotary. Turn right onto Bracket Road and continue until it ends at Nauset Road. Turn left onto Nauset Road and then take the first right onto Cable Road. At the end of Cable Road, turn left onto Ocean View Drive where there is a parking lot available at Nauset Light Beach. The Three Sisters are located about a third of a mile west of the Nauset Lighthouse.